Why do we host these seminars? There is an upcoming opportunity for fuel retailers across Europe to capitalise on a growing demand for AdBlue®. Despite the decline of the diesel market share, the introduction of Euro 6 triggered an increasing number of passenger cars that are SCR equipped, with the SCR light vehicle fleet set to increase by 30 million vehicles in the next decade. This presents a huge opportunity for fuel retailers. The market will be largely serviced by the retail sector, and in certain scenarios it could account for sales of over 2 billion litres of AdBlue® in Europe alone by 2023. 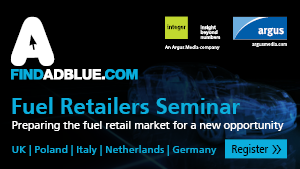 The seminars will provide an unmissable networking and learning experience enabling fuel retailers to make new contacts and partnerships to increase their AdBlue® sales potential. The presentations will equip you with insights required to succeed today’s evolving AdBlue® market, arising from the increase in SCR equipped passenger cars and light-duty vehicles. Fuel retailers can attend the seminars for free. To register your place, simply email us (use the contact form on the right) and a member of the team will be in touch. Following the success of last year’s global Fuel Retailer Seminars, this year the seminars will take place at five different locations.